After reading my book Storm Surge, Capt. Mike Forsyth sent me an email, in which he included the story of his experience in Sandy. It’s a good story, and so with his permission, I am putting it up as a guest post here. What follows is Capt. Mike’s self-introduction, followed by his story. I was born and raised on Staten Island, spent two weeks of most childhood summers on Long Beach Island, NJ, and as an eight-year-old child was brought by my parents to LBI to see a navy destroyer put up on the beach by the Ash Wednesday Storm. I am a tugboat captain, and work for a New York-based tug and oil barge company. If, as “W” said, America is addicted to oil, I am a mule. However, I have been intellectually convinced of the reality of climate change since the mid-1990’s. This was reinforced by a conversation with a meteorologist about a destructive line of storms that came through upstate New York, where I now live, on July 14th, 1995. The reality was driven home, quite literally, when a similar line of storms did $45,000 damage to my home in a few seconds on Labor Day 1998. I support candidates, donate money, keep myself informed, try to reduce my own carbon footprint, and speak out on the issue when the occasion arises. In October of 2012, I was captain of the tug Stephen-Scott, engaged in moving Reinauer Transportation Company’s oil barges in the Northeast. I worked on another Reinauer tug on the Gulf of Mexico during the previous year’s hurricane season and spent a good bit of time following forecasts and tracking storms on charts. On Wednesday morning, October 24th, I drove to Reinauer’s dockyard, at Erie Basin in the Red Hook section of Brooklyn, parked my car and started my two week tour of duty. Almost immediately, I started paying attention to Sandy while she was still in the Caribbean. On Saturday morning, October 26th, I received orders to take a 60,000 barrel barge loaded with diesel fuel from a New Jersey refinery to Newburgh, New York, about fifty-five miles up the Hudson. By that time, it appeared likely that the storm would impact New York Harbor. The Hudson River at Newburgh is within the US Coast Guard Captain Of The Port (COTP) of New York zone, and the USCG had issued a storm-related notice requiring commercial vessels staying in the COTP NY zone to file a “remain in port” plan. My plan was to depart with the barge that evening as ordered, and arrive early Sunday morning at the oil terminal in Newburgh, discharge the cargo of 2.5 million gallons of diesel fuel, then anchor in the Hudson River off Newburgh until New York Harbor was re-opened to navigation. The plan was received and approved by the COTP. The prediction for the storm surge was then four to eight feet. The paved parking area at Erie Basin is at dock level, probably seven or eight feet above the high water level. I expected that there would be some water running across the pavement or possibly a little ponding, if the storm hit at other than low tide. My Honda Element has good ground clearance, but that would not be enough. Before my boat left Erie Basin that Saturday, I drove to the Pep Boys auto parts store in Park Slope and bought a couple of oil-change ramps. Back at Erie Basin, I put a staggered stack of 2×12″ lumber about 8 inches high in front of each rear wheel, and put the oil change ramps in front of the front wheels, and drove ahead and up. I figured that would keep salt water out of the engine compartment, and maybe keep the brakes and suspension out of the water. Our barge discharged its cargo on Sunday, October 28th, and we dropped anchor in the Hudson between Newburgh and Beacon at 8:50 that evening. I was following the forecasts, and had the feeling that my precautions with my car were pitiably, laughably, inadequate. An 8 to 11 foot surge would float the car off the blocks, and fill it with harbor water. Monday morning I checked the forecast, and called my insurance agent to make sure that my comprehensive insurance included flood damage. She confirmed that, and gave me the telephone number for claims, which I told her I expected to use later that week. There was absolutely nothing more I could do. Within an hour, I got a phone call from Chris, the captain of the tug Jill Reinauer. He told me that his boat and the Kristy Ann Reinauer were at Erie Basin and their crews were moving all the cars they could to higher ground. I told him where my spare key was. I told the other tug and barge crewmembers to call the Jill or the Kristy, so that their cars might be saved. I woke up my first mate, Davey, and asked about his spare key. He told me that his new car had a “smart” key, so smart that a new one cost about two hundred dollars, so he hadn’t had a spare made. Too smart for its own good, his car was a total loss by nightfall. Someone sent him a cell phone video of his car, doors-deep in water with the lights flashing and windows going up and down while the salt water shorted out the electrical connections. Sunday night and Monday, several other tug and barge units had joined us at anchor off Newburgh. Monday afternoon and evening, the wind and rain came through, fierce, but a pale shadow of what had befallen the coast. Like the other captains and mates, we kept a close watch on GPS chart plotters and radar, in case the wind and current caused a vessel to drag anchor. I also watched our depth sounder, and compared the readings to the charted depth and the predicted normal tidal changes. The depth under the keel reached the predicted maximum early, and continued to increase. On the electronic display of our depth sounder, I could see the storm surge from Sandy pass under our keel, several feet above the maximum predicted by the moon and the sun, while a powerful current carried this surge of water upriver. On the chart plotter, a neat circle, centered on the spot where our anchor had dropped, circumscribed what should have been our range of motion in any direction. The “own ship” icon on the chart plotter crept slightly closer to the edge of the circle. I started the twin 1,700 horsepower engines and put the propellers in gear at low speed to try to oppose the force of the surge. The radar range to the next vessel anchored up river began to decrease, and it was clear that our anchor was dragging. I have dragged anchor numerous times on the Hudson. However, that usually happens when gravity carries the run-off from heavy rains or snow-melt down from the hills and mountains, adding fresh water to the ebb tidal flow, and usually with a northwesterly gale blowing as well. I have never, before or since, dragged anchor on the flood current of incoming ocean water in the Hudson. We picked up the anchor, stemmed the tide under power, and when the surge had passed, we re-anchored, and remained there until November 1st. We moved down to the section of river off the Upper West Side of Manhattan, and anchored for another two days, until portions of New York Harbor were re-opened to limited navigation. During this time at anchor, I received welcome news that my car had been moved from Erie Basin to the roof of the parking garage of the nearby Gowanus branch of The Home Depot, and then returned to Erie Basin, none the worse for the experience. Some cars were moved from Erie Basin, but parked in the lower level of the Red Hook Ikea parking garage. They did not fare as well, since all basements and first floors in Red Hook were inundated by the surge. About forty cars were saved. Returning to Erie Basin on November 4th, I counted twenty cars and pickup trucks belonging to fellow employees which obviously had not been moved out of harm’s way. I was puzzled by big dents in the roofs of some of them. Then I saw some anchor buoys, yellow-painted hollow steel balls about four feet in diameter which are used to mark the location of dredge anchors. These had obviously come from the far side of Erie Basin, and were on the pavement by a chain link fence which is the boundary of the employee parking area. They apparently floated across the basin, blown by the wind, until they came up against the fence, floating above the parked cars. The dents in the roofs were made by the steel buoys, bobbing up and down on waves and pounding on the roofs. The oil change ramps would not have done the job. The waterfront was dramatically changed by Sandy, with destruction and large mis-placed items all around. Most striking for several days after the harbor re-opened was the absence of lights. For decades, New York mariners have been complaining about light pollution, more numerous and brighter lights on shore, which impair night vision and can make buoys and navigational lights difficult to see. The power was out at most waterfront facilities, including oil docks, for a long time after the storm. Here and there were construction lights from a portable generator, or an isolated dock which had power restored, but mostly we had a dark shoreline for a couple of weeks. With most of the oil terminals in the metropolitan area out of commission, I reflected that the 2.5 million gallons of diesel fuel which we delivered probably was put to good use in the immediate recovery from the storm, since Newburgh had some of the closest oil terminals to New York which were still in operation. At the end of my two weeks, I was able to drive home in my own car, thanks to efforts in the teeth of the storm by the crews of two tugboats, and to the people at the Gowanus Home Depot. The tugboatmen did something above and beyond the call of duty or any job description, bordering on heroic. Boatmen don’t have to do these things, but no one in the business is surprised when they do. It is almost expected. (The first four Apostles were boatmen, not farmers or shopkeepers or divinity students, and the choice was probably well-considered.) However, the folks at Home Depot could have easily blathered some corporate line about liability, and closed their doors to those seeking shelter from the storm. Instead, they did a great thing for people in their neighborhood, including Erie Basin in Red Hook. That deserved some recognition. I had three dozen custom tee shirts made. On them was imprinted the legend, “Hurricane Sandy – October 29, 2012 – Heroes of Erie Basin” at the top, followed by drawings of the two tugboats done by a professional artist, and at the bottom, “The Crews of the Tugs Jill Reinauer and Kristy Ann Reinauer, and Home Depot, Gowanus, Brooklyn”. On my next crew change, I went to the Home Depot, saw the assistant manager, and gave him half the tee shirts to distribute to those deserving however he saw fit. He was overwhelmed. He had a co-worker hold a shirt while he took a cell phone photo and sent it to his manager at home. I gave the other half to the tugboat crews who moved the cars in the wind, rain and rising water. A few months later, I started a kitchen remodeling project and ordered $2,400 worth of cabinets from Home Depot, which, pre-Sandy, I would have bought somewhere else. Check out the blog post on Typhoon Maysak, on the blog of the Columbia Initiative on Extreme Weather and Climate, by the brilliant and talented postdoc Chia-Ying Lee. I spent last week on Jeju Island, South Korea, for the Eighth International Workshop on Tropical Cyclones (IWTC-VIII) organized by the World Meteorological Organization (WMO). Every four years, the WMO convenes this meeting, which gets together forecasters and researchers from all over the world to review the last four years’ advances in the science of tropical cyclones (also known as hurricanes, typhoons etc.). It’s an invitation-only meeting, which reflects (or maybe is one of the causes of) the fact that tropical cyclone experts are a close-knit club. I had never been invited before, which I took to mean that I was not really part of the club. I guess I am now. 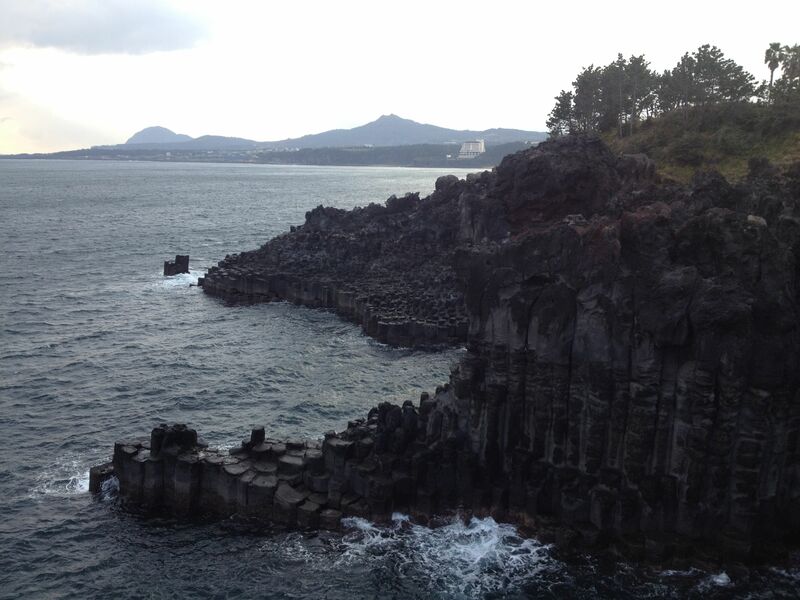 View east along the south coast of Jeju Island, near Jungmun Beach. In the foreground are basalt columns formed by rapid cooling of lava. In the months before the meeting, the scientists involved put together a report to the WMO summarizing the advances since the last meeting in both basic science and operational forecasting practices. The structure of the meeting reflects the structure of the report. There are five overarching topics, each of which is a chapter, and a session of the meeting: 1. Motion; 2. Cyclogenesis, intensity and intensity change; 3. Communication and effective warning systems; 4. Structure and structure change; 5. Beyond synoptic timescales. Each topic has multiple subtopics, each subtopic has a “rapporteur” (or sometimes two) who led a team of people in the writing of their part of the report; the overall topic has a “topic chair” who organizes all of the subtopic reports and writes an introduction to the whole chapter. I was the topic chair for topic 5, “Beyond synoptic time scales”. The word “synoptic” here refers to the time scale of a typical tropical cyclone forecast, a few days. The subtopics were climate change, seasonal forecasting, and intraseasonal forecasting – in that order, decreasing the time horizon sequentially.Seasonal forecasts are forecasts of overall tropical cyclone activity (with no details about specific storms on specific dates) for a particular region, made months in advance. The most important phenomenon that controls TCs on this time scale and makes the forecasts possible is El Nino. The “intraseasonal” time scale, also known as “subseasonal”, covers everything shorter than that, but longer than the range of a typical weather forecast. So, about 10 days to a month or two. On this time scale, the most important single phenomenon (though not the only one) modulating TC activity is the Madden-Julian oscillation, or MJO (see also here, here, and here). Although I wasn’t at previous IWTCs, my sense is that at the last few, climate change has been a contentious topic. Around 2005, Katrina and the hyperactive Atlantic season of that year, combined with a couple of high-profile papers showing increasing trends in various measures of TC activity, caused a dramatic increase in the volume of research being done on the links between climate and TCs (and in the number of researchers doing it). Combined with some historical cultural differences between TC experts and climate scientists, this led to some growing pains in the field in the mid-late 2000s. A lot of that has been sorted out now. Not that we know everything or that everyone agrees on the fundamentals – far from it – but the field has advanced rapidly in a decade, and a lot of the early contention has shaken out. It’s much clearer what we know and what we don’t. So this part of the meeting, and the report, while not without debate, was actually relatively placid. In my view the most exciting new developments have been in the intraseasonal arena. Just a few years ago – certainly a decade ago – weather forecast models could not predict the MJO to save their lives. The best ones have become dramatically better at it, and now show skill in MJO prediction out to as long as 4 weeks’ lead time. Since the MJO influences tropical cyclones, this – combined with broader overall improvement in the models – makes new kinds of forecasts possible, well beyond the 5-day time frame of current tropical cyclone forecasts. Forecasts in this range, let’s say a week to 2-3 weeks, are just barely starting to come into view. They exist still mostly in research mode, and are mostly not yet issued to the public. There are a few exceptions; an example is the NOAA CPC Global Tropics Hazards and Benefits Outlook, a “climate-like” product which defines large areas in which things could happen in the next two weeks. Other, more weather forecast – like products are clearly possible, such as long-range forecasts of the track and intensity of a specific storm that are produced several days before it has formed (currently, no agency issues public track and intensity forecasts for a tropical cyclone before it actually exists) – such forecasts would not be highly accurate, but could give some indication of a threat to a broad region ten, or even 15-20 days in advance. The science and technology now exist, since just recently, to issue products with some skill in this range. But forecasters are conservative. Before they’ll issue such products, they need time to understand how good or bad these forecasts are, and to learn how to communicate them effectively so that users of the forecasts grasp the uncertainties. Typhoon Hagupit on December 4, 2014. Day-night visible image from the VIIRS sensor on the NPOESS satellite, from the CIRA TC web page. Meanwhile, during the whole conference, Typhoon Hagupit was drawing closer to the Philippines. It was quite a fearsome storm at midweek, reaching Super Typhoon status. We had regular forecast briefings during the latter part of the conference, from the Japanese and Korean Meteorological Agencies. Thankfully the storm weakened quite a bit before landfall. 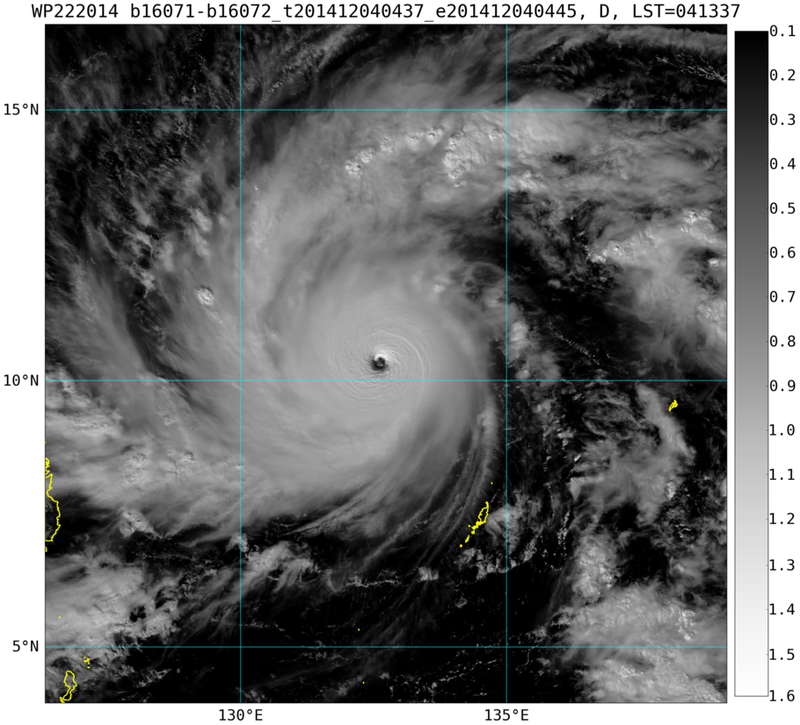 Between that and better evacuations, it looks so far like it won’t be near the disaster that Haiyan was last year. But Hagpuit provided a constant vivid reminder, as one presenter said at the start of this talk, of “why we do this”. Typhoon Phanfone has been closing in on Japan for days, and is in the process of making landfall as I write. The storm earlier had made it to the bottom end of category four on the Saffir-Simpson scale, with peak sustained winds of 130 knots and a very small “pinhole” eye. The pinhole eye is almost always a sign of a scary storm, because the way tropical cyclones develop really strong winds is by contracting their eyewalls inward. As with a skater who pulls her arms in while she does a spin on the ice, conservation of angular momentum increases the rate of rotation because the distance from the axis has shrunk. By now the storm is considerably weaker, with peak sustained winds estimated at 80 knots, category 1. According to the cyclone phase space diagnostic of Prof. Robert Hart at Florida State University, Phanfone is in the process of extratropical transition, turning into an extratropical or “winter” type storm. It has lost its eye and most of its circular symmetry, as one can see in the current infrared satellite image, and is forecast soon to lose its warm core. 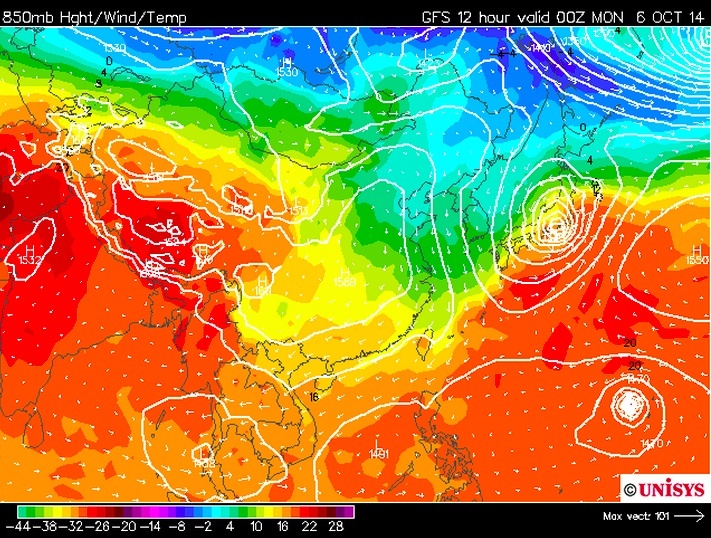 In a current weather map with colors showing temperature at 850 hPa (about 1.5 km above the surface; this is actually a plot from the most recent 12-hour forecast made by NOAA’s GFS model about 12 hours ago, image courtesy weather.unisys.com), one can see the strong contrasts associated with fronts, typical of extratropical storms, cutting through the center. The strongest rains will be on the left side of the track – over land – as the moist tropical air rides counterclockwise up and over the colder air mass to the west. Despite its weakened status, Phanfone is still no joke. The rains will likely be in the hundreds of mm (100 mm = about 4 inches), including likely on Mount Ontake, the volcano where over 50 people died in the recent eruption and the recovery of bodies is still ongoing. 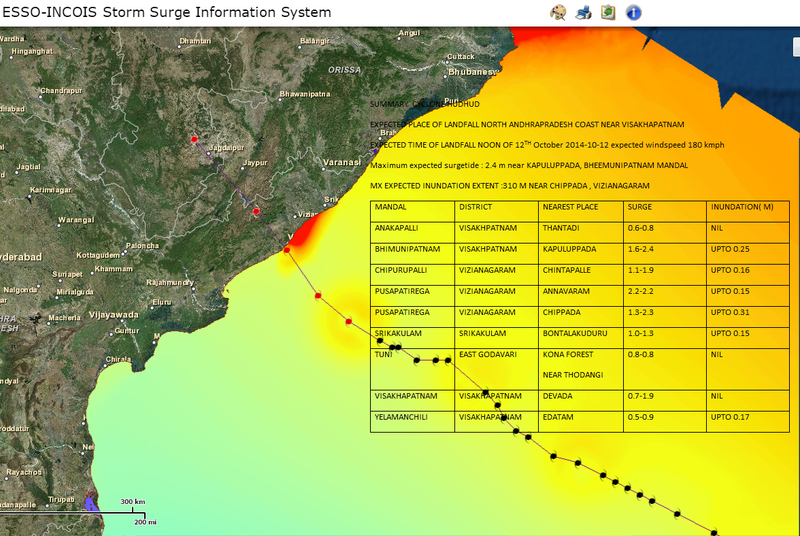 The storm surge forecasts appear to be in the 1-2 meter range, or 3-6 feet. The warnings appear to be concentrated in Fukushima prefecture, site of the 2011 tsunami-induced nuclear disaster. While storm surges and tsunamis have completely different causes, they are otherwise very similar phenomena – either way something pushes the sea onto the land. The 1 or 2 meters this typhoon is forecast to produce are nothing compared to the 40 meters that the earthquake of three and a half years ago produced, so that’s good. But still… I have no detailed knowledge of the current state of the Fukushima Daiichi nuclear complex, but my understanding is that it is still not in particularly great shape. I hope that 1-2 meters of surge plus combined heavy rains and wind aren’t enough to do any more serious harm to this already awfully blighted place. In news coming in now: images of flooding, and speculation that Tokyo, almost directly in the path of the center, might see an all-time record for strongest wind. On August 12 and 13, a new record was set for the most rainfall in a 24-hour period at any location in New York State. 13.57 inches of rain fell in 24 hours at Islip MacArthur Airport in Long Island. (That’s about 345 mm, for anyone outside the US.) This breaks by about 2 inches the previous NY State record, set just three years earlier, in August 27-28 during Hurricane Irene in Tannersville, NY. The new record was officially verified by the National Weather Service just this past Wednesday, in this Public Weather Statement put out by our local office, in Upton, NY (which happens also to be on Long Island, not far from where the record-breaking rainfall fell). You can watch the radar animation on the web page and see what was going on. Not only was the “mean storm motion … parallel to the orientation of the front”, but the shape of the storm, as evident in the radar reflectivity (which is a very close indication of where rain was falling and how hard), was roughly linear and oriented along the front. The storm was like a long thin snake moving almost exactly straight ahead, with no component of the motion perpendicular to itself. Any point below it stayed below it as it moved. This is often how the very highest rainfall totals are achieved at single locations: not just a hard rain, but a hard rain staying in the same place for a good while. This means either a storm that sits still – as in the record-breaking floods in Boulder, Colorado last September – or one that is so large that it takes a long time to entirely pass over, even though it’s moving. Tropical cyclones in particular can rack up huge accumulations, as they are sometimes all of the above: big, dumping prodigiously, and slow. Irene in 2011, our previous record-breaker, was an example of this. Or, a storm like this Islip system – long in one direction and moving in exactly that direction – can do it. Mountains help. A strong wind carrying moist air into the side of a mountain – where it will be forced uphill, cooling as the pressure drops and condensing the vapor – is a key ingredient in a lot of records, including the previous one set in Irene in Tannersville. That town is in the Catskills, right up against Hunter Mountain, a popular ski resort with a summit 3200 feet high (a respectably big mountain in this part of the world). In this new Islip record, though, no mountains were involved. Long Island is quite flat. While the new record is for the 24-hour rain total, the time series graph of rain rate and accumulation on the NWS page shows that most of it – about 10 inches – fell in just 2 hours. This rapid dump made for some very severe flash flooding. The page shows many photos of cars submerged and washed off the road, as described in the New York Times story the day after. Yes, this is exactly the kind of thing we expect to happen more in a warming climate. A warmer atmosphere can contain more water vapor, and that gain can be realized in extreme precipitation events (even though global average rainfall will increase more slowly than water vapor does, because it is constrained by global energy balances which don’t track water vapor and can’t change as easily). So records like the one that just broke are going to break more frequently than they used to, and already are. I’m sorry I wasn’t in Islip to see 13.57 inches of rain – or even in the city, which got a couple inches; I was out of town altogether. (I have seen a daily rainfall in that ballpark just once, in Darwin, Australia, where I had gone specifically to see it, which is a story I will write about another day.) But just so we aren’t too awfully impressed, the global record for 24 hour rainfall is 1.825 meters, or 71.8 inches. That’s more than 5 times our new New York State record. This record was set on La Reunion, an island in the south Indian ocean – in a tropical cyclone, on the side of a mountain.